Smilovic, M., Gleeson, T., Adamowski, J. and Langhorn, C. – Optimizing agricultural water use with supplemental irrigation. 56) Hartmann, A., Gleeson, T., Wada, Y., Wagener, T. (2017) Enhanced groundwater recharge rates and altered recharge sensitivity to climate variability through subsurface heterogeneity. Proceedings of the National Academy of Science 115: 2842-2847. doi:10.1073/pnas.1614941114. Highlighted in Nature Climate Change. 54) Mundy, E., Gleeson, T., Roberts, M., Baraer, M. and McKenzie, J. M. (2017) Thermal imagery of groundwater seeps: possibilities and limitations. Groundwater 55: 160-170 doi: 10.1111/gwat.12451. 47) Currell, M., Gleeson, T., Dahlhaus, P. (2016) A framework for assessing the importance of transience in groundwater management. Groundwater 54: 4-14 doi: 10.1111/gwat.12300. 45) Van Loon, A.F., Gleeson, T., Clark, J., Van Dijk, A.I.J.M., Stahl, K., Hannaford, J., Di Baldassarre, G., Teuling, A.J., Tallaksen, L.M., Uijlenhoet, R., Hannah, D.M., Sheffield, J., Svoboda, M., Verbeiren, B., Wagener,T., Rangecroft, S., Wanders, N., Van Lanen, H.A.J. Drought in the Anthropocene. Nature Geoscience 9: 89-91 doi: 10.1038/ngeo2646. 44) Doyle, J.M., Gleeson, T., Manning, A.H. and Mayer, U. (2015) Using noble gas tracers to constrain a groundwater flow model with recharge elevations: a novel approach for mountainous terrain. Water Resources Research 51: 8094- 8113 doi: 10.1002/2015WR017274. 43) Jasechko, S., Lechler, A., Pausata, F.S.R., Fawcett, P.J., Gleeson, T., Cendón, D.I., Galewsky, J., LeGrande, A.N., Risi, C., Sharp, Z.D., Welker, J.M., Werner, M., Yoshimura, K. (2015) Late-glacial to late-Holocene shifts in global precipitation δ18O, Climate of the Past. 11, 1375-1393,doi:10.5194/cp-11-1375-2015. 42) Smilovic, M., Gleeson, T., and Siebert, S. (2015) The limits of increasing food production on non-irrigated fields in India. Food Security, 7, 4: 835-856. 34) Milly, P. C. D., Malyshev, S.L., Shevliakova, E., Dunne, K.A., Findell, K.L., Gleeson, T., Liang, Z., Phillips, P., Stouffer, R.J. and Swenson, S. (2014) An enhanced model of land water and energy for global hydrologic and earth-system studies. Journal of Hydrometerology, 15, 1739–1761. doi: 10.1175/JHM-D-13-0162.1. 31) Kim, J., Ryan, R., Klepeis, K., Gleeson, T., North. K., Bean, J., Davis, L. and Filoon, J. (2014) Tectonic evolution of a Paleozoic thrust fault influences the hydrogeology of a fractured rock aquifer, northeastern Appalachian foreland. Geofluids, 14: 266-290 doi: 10.1111/gfl.12076. 28) McDonald, R.I., Weber, K., Padowski, J., Flörke, M., Schneider, C., Green, P.A., Gleeson, T., Eckman, S., Lehner, B., Balk, D., Boucher, T., Grill, G., Montgomery, M. (2014) Water on an urban planet: urbanization and the reach of urban water infrastructure. Global Environmental Change, 27(0), 96-105 doi: 10.1016/j.gloenvcha.2014.04.022. 27) Voss, C., Currell, M. and Gleeson, T. (2014), Editors’ Message: The 2013 Editors’ Choice articles, a new editor, and the 2013 ‘Coolest Paper’ award, Hydrogeology Journal, 22(2), 293-294. doi:10.1007/s10040-014-1111-7. 26) Malgrange, J. and Gleeson, T. (2014) Shallow, old and hydrologically insignificant fault zones in the Appalachian orogeny. Journal of Geophysical Research: Solid Earth, 119 (1), 346-359 doi:10.1002/2013JB01035. 25) Gleeson, T. and Paskowski, D. (2014) Perceptions of scale in hydrology: what do you mean by regional scale? Hydrological Sciences Journal. doi:10.1080/02626667.2013.797581. 24) Gassiat, C., Gleeson, T., Lefebvre, R. and McKenzie, J. (2013) Hydraulic fracturing in faulted sedimentary basins: numerical simulation of potential long term contamination of shallow aquifers. Water Resources Research , 49, 8310–8327, doi:10.1002/2013WR014287. 22) Bense, V.F., Gleeson, T., Loveless, S.E., Bour, O., and Scibek, J. (2013) Fault zone hydrogeology. 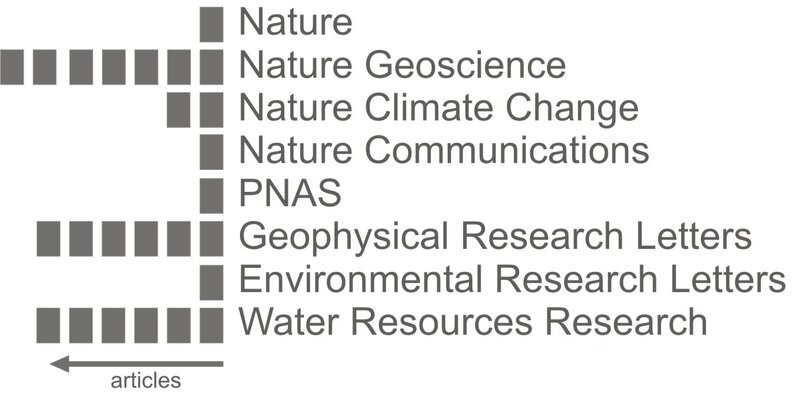 Earth-Science Reviews 127 (2013) 171–192.doi: 10.1016/j.earscirev.2013.09.008. 21) Gleeson,T., Wada, Y., (2013) Assessing regional groundwater stress for nations using multiple data sources with the groundwater footprint. Environmental Research Letters. 8 044010 doi:10.1088/1748-9326/8/4/044010 . 19) Ferguson, G. and Gleeson, T. (2013) Reply to 'Threats to coastal aquifers', Nature Climate Change, 3(7): 605-606, doi:10.1038/nclimate1930. 18) Gassiat, C., Gleeson, T., Luijendijk, E. (2013) The location of old groundwater in hydrogeologic basins and layered aquifer systems. Geophysical Research Letters, 40: 1–6, doi:10.1002/grl.50599. 17) Priyanka, P., Gleeson, T. and Baraer, M. (2013) Towards quantifying discrete groundwater discharge from frozen seepage faces using thermal infrared images. Geophysical Research Letters, 40: 123–127, doi:10.1029/2012GL054315. 16) Aeschbach-Hertig, W. and Gleeson, T., (2012) Regional strategies for the accelerating global problem of groundwater depletion. Nature Geoscience, 5: 853-861. doi:10.1038/ngeo1617. 15) Gleeson, T., Wada, Y., Bierkens, M.F.P. and van Beek, L.P.H. (2012) Sustainable water balance of global aquifers revealed by groundwater footprint. Nature, 488: 197–200. http://dx.doi.org/10.1038/nature11295. 14) Gleeson, T., Allen, D.M. and Ferguson, G. (2012) Teaching hydrogeology: a review of current practice. Hydrology and Earth System Science, 16: 2159-2168. doi:10.5194/hess-16-2159-2012. 13) Dugan, H., Gleeson, T., Lamoureux,S. and Novakowski, K., (2012) Radon-222 as a groundwater tracer in a high arctic lake. Environmental Earth Sciences, 66:1385-1392 . 12) Ferguson, G. and Gleeson, T. (2012) Vulnerability of coastal aquifers to climate change and groundwater use, Nature Climate Change, 2: 342-345. doi:10.1038/nclimate1413 . 9) Gleeson, T., Smith. L., Jansen, N., Hartmann, J., Dürr, H., Manning, A.H.,van Beek, R. and A.M. Jellinek (2011) Mapping permeability over the surface of the earth. Geophysical Research Letters, 38, L02401, doi:10.1029/2010GL045565. 8) Gleeson, T., VanderSteen, J., Sophocleous, M.A., Taniguchi, T., Alley, W.M., Allen, D.M., and Zhou,Y. (2010) Groundwater sustainability strategies. Nature Geoscience, 3:378-379. 7) Gleeson, T., Novakowski, K., Cook, P.G. and Kyser, T.K. (2009a) Constraining groundwater discharge in a large watershed: integrated isotopic, hydraulic and thermal data. Water Resources Research, 45, W08402, doi:10.1029/2008WR007622. 6) Gleeson, T., Novakowski, K. and Kyser, T.K. (2009b) Extremely rapid and localized recharge to a bedrock aquifer. Journal of Hydrology, 396: 496-509. 4) Gleeson, T. & Manning, A.H. (2008) Regional groundwater flow in mountainous terrain: simulating topographic and hydrogeologic controls. Water Resources Research, 44, W10403, doi:10.1029/2008WR006848. 2) Godin, L., Gleeson, T., Searle, M.S., Ullrich, T.D. and Parrish, R.R. (2006) Locking of southward extrusion in favor of rapid crustal-scale buckling of the Greater Himalayan Sequence, Nar Valley, Central Nepal, in "Continental Collision Zones: Extrusion, Channel Flow and Exhumation" edited by R. Law, M.S. Searle, and L. Godin, Geological Society of London, Special Volume 268, 268-292. 1) Gillis, K.M., Muehlenbachs, K., Stewart, M., Gleeson, T. and Karson, J.(2001). Fluid flow patterns in fast-spreading East Pacific Rise crust exposed at Hess Deep. Journal of Geophysical Research 106: 26,311-26,329.
but ​this page is long enough, as is! So contact me if you want more info!